FREE SHIPPING with $50 minimum purchase - On All Domestic Orders To The Lower 48 States! ORDER ONLINE OR CALL 1-800-343-4446! Low VOC, High solids content, rapid cure and superior physical properties. ULTRA-GUARD 5700 Silicone Mastic approximate coverage is 25 square feet per gallon. ULTRA-GUARD 5700 Silicone Mastic has a minimum shelf life of one year when stored at temperatures between 32o F and 100o F.
ULTRA-GUARD 5700 Silicone Mastic is applied by brush or trowell at thicknesses up to 1/4″. ULTRA-GUARD 5700 Silicone Mastic should be applied directly from the container without thinning. Sprayed Foams: No primer necessary. Consult manufacturer for application to other surfaces. This item is not available to purchase online and requires you to give us a call at 1-800-343-4446. J&R Products offers FREE SHIPPING for all domestic orders that total over $50 and are shipping to the lower 48 states. If you are needing items shipped outside of this area, please give us a call at 1-800-343-4446 to complete your order. The Ultra-Thane Foam System is used as a nonstructural thermal insulating material for Class A or Class B roof coverings, and roofing recovers over existing classified roof systems. Roof coverings with an A or B classification, as noted in Table 1, are permitted on buildings of any type of construction. The Ultra-Thane Foam System consists of the Ultra-Thane 230 Roofing Foam, a spray-applied polyurethane foam plastic, covered with Ultra-Flex 1000 or Ultra-Guard 5700, liquid applied, elastomeric coatings. 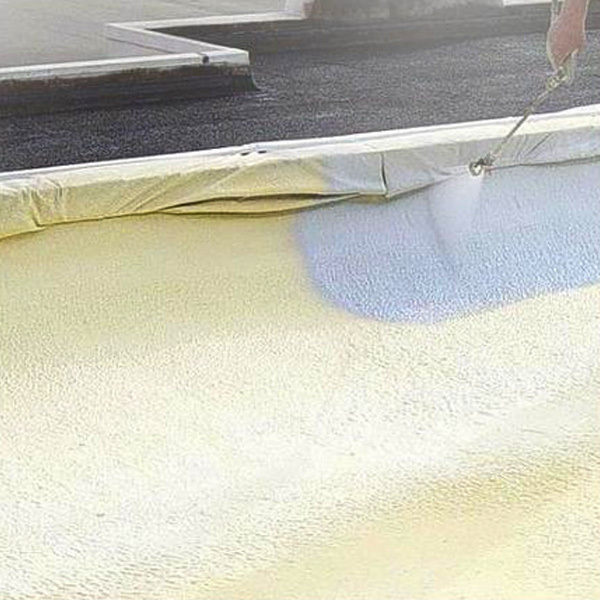 The Ultra-Thane 230 Roofing Foam consists of two components, “A” (isocyanate) and “B” (polyol resin), which are intended to be interacted in a one to one ratio, by volume, and spray-applied to form a closed cell rigid foam plastic roof covering/insulation material with a nominal density of 3 pounds per cubic foot. The A and B components are available in 55 gallon drums and have a shelf life of 6 months when stored at temperatures between 50°F and 80°F. Further information may be found at www.generalcoatings.net. ULTRA-GUARD 5700 is a single-component silicone elastomer specifically designed to protect construction surfaces from the effects of weather and moisture. The outstanding features of ULTRA-GUARD 5700 are its high solids content, rapid cure and superior physical properties. ULTRA-GUARD 5700 is designed as a two-coat system consisting of a basecoat with a contrasting colored topcoat. ULTRA-GUARD 5700 is designed to provide a durable elastomeric protective coating for sprayed polyurethane foam insulation. ULTRA-GUARD 5700 can be used by itself as the complete protective coating membrane. With the addition of ceramic roofing granules embedded into the coating surface, superior abrasion resistance is achieved. ULTRA-GUARD 5700’s dry time may be shortened with the addition of an accelerator package. ULTRA-GUARD 5700 exhibits excellent adhesion to sprayed-in-place polyurethane foam as well as other construction surfaces. ULTRA-GUARD 5700 retains its flexibility and membrane integrity from -80o F to +250o F.
hours Accelerated Weathering exposure in an Atlas carbon arc weatherometer according to ASTM D-822. ULTRA-GUARD 5700 has excellent heat resistance to 250o F, good salt, acid and solvent resistance, and fair alkali resistance. ULTRA-FLEX 1000 is a high-solids, heat-resistant, single-component water-borne acrylic elastomeric coating. ULTRA-FLEX 1000 is formulated to have excellent adhesion to polyurethane foam as well as other properly prepared construction surfaces. Standard colors are Dark Gray, Light Gray, and White. Other colors are available on special order. ULTRA-FLEX 1000 has a theoretical dry film thickness of 8.6 mils when applied at 1 gallon per 100 square feet. ULTRA-FLEX 1000 has a minimum shelf life of one year when stored at temperatures between 40oF and 80oF. Caution should be exercised to prevent material from freezing. ULTRA-FLEX 1000 should be applied directly from the container without thinning. The Ultra-Thane coated foam plastic roof covering system consists of a liquid-applied coating (Ultra-Flex 1000) over a spray-applied polyurethane foam plastic insulation (Ultra-Thane 230). General Coatings Ultra-Thane 230 Roofing Foam is a two component, spray-applied, polyurethane foam plastic insulation produced in a nominal density of 3.0 pcf (48.0 kg/m3). The foam plastic ingredients (Component A and Component B) are available in 55-gallon (208 L) drums and have a shelf life of nine months for Component A and six months for Component B when stored in unopened containers at temperatures between 50°F and 80°F (10°C and 26.7°C). The foam plastic insulation has a flame-spread rating of 75 or less when tested in accordance with ASTM E84 or UL 723 at a maximum thickness of 2.0 inches (51 mm). General Coatings Ultra-Flex 1000 coating is a single-component, liquid-applied, 100 percent acrylic elastomeric coating complying with ASTM D6083. It is supplied in 5-gallon (18.9 L) pails, 55-gallon (209 L) drums and 275-gallon (1041 L) totes; and has a shelf life of 12 months when stored in unopened containers at temperatures between 50°F and 80°F (10°C and 26.7°C). None of our operators are available at the moment. Please, try again later or leave us a short message so we can get back in touch with you.